Did you know that cats are only half as likely to see the veterinarian as dogs, even when they're sick? According to a study by the American Veterinary Medical Association, dogs visit the vet about 2.3 times a year compared to cats' 1.1 annual visits. And only 28 percent of cats see a vet once or more a year in contrast to 58 percent of dogs. Many veterinarians attribute this discrepancy to people's false perception that cats are self-sufficient and don't need medical care, whereas in fact cats, as a survival trait, are adept at concealing early signs of illness and appear healthy when they may be ailing. Often a cat's illness manifests only when it becomes more difficult "and expensive" to treat. To emphasize the importance and value of annual feline veterinary check-ups, Feline Pine, the manufacturer of natural cat litter, has expanded its sponsorship of last year's one-day Chicago-only event to this year's National Take Your Cat to the Vet Week, which runs from Aug. 16 to 22. The program's goal is to educate and inform the public about the benefits of regular check-ups for cats. 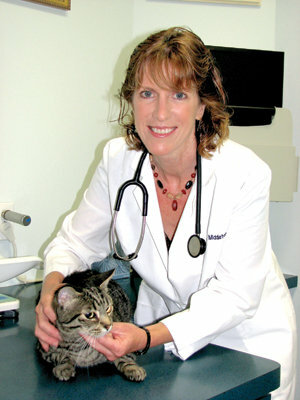 Preventive care for cats, as with dogs and humans, can result in significant savings in the long term, explains Dr. Ann Middleton, veterinarian and owner of Clairemont's Cheshire Cat Feline Health Center and San Diego spokesperson for the educational campaign. "It's more cost-effective to bring the cat in for a regular check-up since waiting until cats are seriously ill could entail quite costly hospitalization and worse prognosis," she says. Many conditions respond well to early diagnosis and intervention. Two of the most common and potentially dangerous conditions for aging cats are obesity and an over-active thyroid (hyperthyroidism). "Obesity can cause diabetes, arthritis, skin infections, respiratory problems, and be hard on the heart. High thyroid hormone can cause a high metabolic rate leading to hypertrophy of the heart muscles, high blood pressure and weight loss. If untreated, the cat may die from congestive heart failure. If treated, the prognosis is usually excellent," she explains. Middleton, along with several veterinary associations, recommends an annual "well kitty" exam up to age 10, unless there's a problem, increasing to two annual visits between 10 and 15, and three a year over 15, depending upon the individual cat's health. While many people resist vet visits because the cat screams in the cat carrier and the car, pet parents should watch for symptoms triggering a needed medical call. Among these signs are loss of appetite, weight loss or gain, more frequent vomiting, changes in stool consistency or increased water drinking or urinations. Other key indicators include lethargy, difficulty breathing, cat fight wounds or infections, car or other injuries, red or sore gums, limping, seizures, exposure to poisons, poisonous plants, snakes or spider bites. Signs of respiratory problems, including coughing, sneezing, eye or nose discharge, or a closed eye, as well as litter box problems or aggression also signal a need for a diagnostic vet visit, Middleton explains. One of the best ways to prevent serious and potentially fatal illnesses is regular vaccinations. Middleton recommends that cats and kittens be vaccinated against feline viral rhinotracheitis, calicivirus, and panleukopenia (FVRCP); feline leukemia, and rabies. She also recommends flea control products even for indoor cats in summer, when fleas can come into the house on shoes or pass through a screened door or window, and year-round for cats going outside. Cats also need to have their teeth professionally cleaned periodically and brushed regularly. The newly expanded National Take Your Cat to the Vet Week resulted from the positive response Feline Pine received from both veterinarians and the general public about its educational efforts. Thanks to National Take Your Cat to the Vet Week, more cats may be eyeing their carriers with trepidation and disdain, but they may also live longer and healthier lives. Clairemont, visit www.cheshirecatclinic.com, or call 858-483-1573.